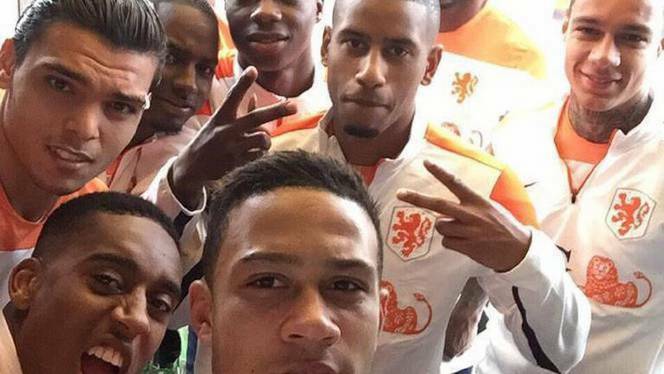 The Dutch public prosecutor Tuesday began investigations into allegations of racist reactions on social media to a selfie made by players of the Dutch national football team. A decision on possible prosecution will be taken after a preliminary study, in which the public prosecutor will collect the facts, reports Xinhua. Last Friday Dutch international Leroy Fer posted a photo, made by colleague Memphis Depay, on Instagram and Twitter. On the picture Fer and Depay pose with seven other internationals, all coloured. It led to a flood of responses, including racist, with people comparing the players with monkeys, slaves and Black Pete, a controversial black figure during the current 'Sinterklaas' celebration in the Netherlands. "I cannot imagine this occurs in 2014 in the Netherlands," Fer said Monday. "The comments hurt me deeply. I am sad and disappointed at the same time. I feel like people want to say that I do not belong in the Dutch national team. These fans probably produced the loudest cheer when I scored at the World Cup against Chile." Netherlands captain Robin van Persie also stood up against racism, saying, "This makes me very sad. It is shocking that this is still happening in 2014. We all represent the Dutch national team and colour is not an issue. This should be tackled hard. It's time to set an example." Answering questions in parliament Monday, Dutch Minister of Security and Justice Ivo Opstelten called the comments "disgusting" and announced that the issue would be handled "seriously".